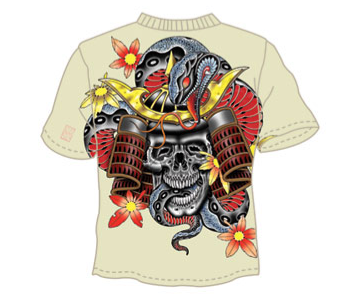 Tees And Tats is a New York City shop that specializes in tee shirts designed by world famous tattoo artist Marco Serio … The designs on these shirts flows around the body just like a real tat. These shirts are numbered limited editions… And… Owners Jeremy and Ben give a percentage to the Artworks Foundation … a non profit that provides children and young adults suffering from chronic and life-threatening illnesses, and their siblings, access to creative and performing arts programs. The skull is symbolic of ‘great change’ and is often associated with death because death represents the biggest change a person experiences. A signed, limited edition. RYUU: Legend has it that Fudo had to fight the representative of a different religion. He changed himself into a flaming sword but the opponent did the same and the fighting went on without a winner. 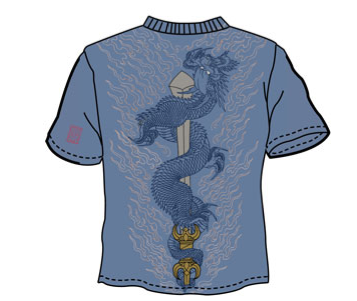 Now Fudo changed himself into the Dragon Kurikara, wound himself around the opposing sword and started eating it from the top. FUDO: The Buddhist divinity of wisdom and fire. 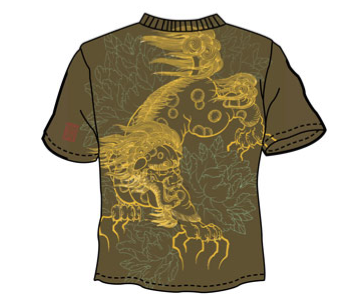 He is the principal deity of the Myo-o, or great kings. 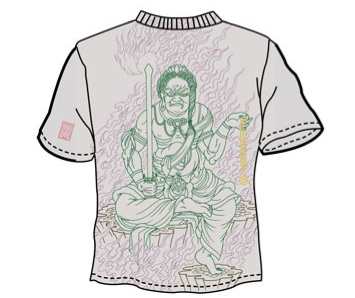 Fudo is often called upon for protection during dangerous times. Shishi (or Jishi) is translated as “lion” but can also refer to a deer or dog with magical properties and the power to repel evil spirits. 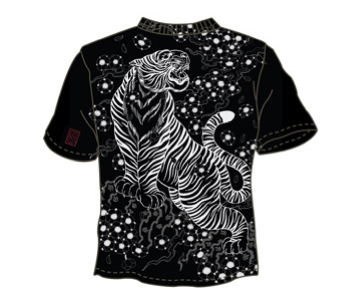 In Japan the tiger is the emblem of the great aristocractic warriors known as the samurai. The tiger represents the virtue of courage. It also means revision, improvement, and change.